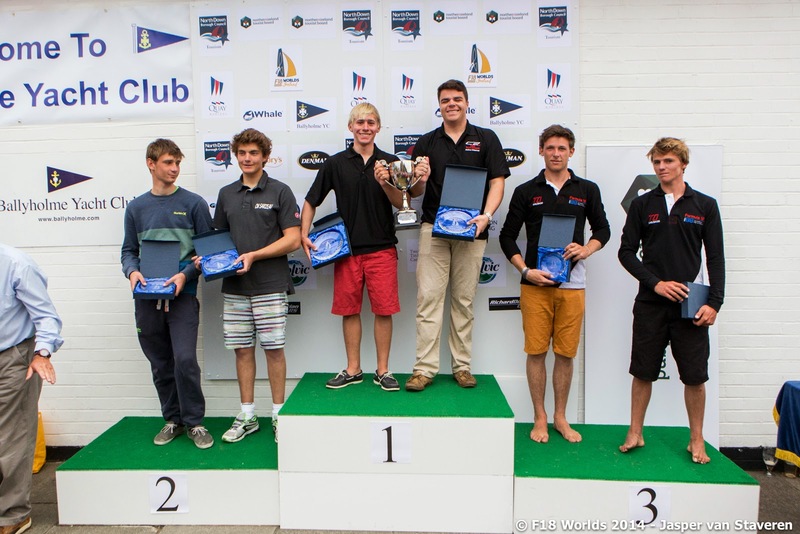 F18 Worlds 2014 @Ireland: Final Day , Larsen-van West Champs. Current Results after 13 Races 2014.f18worlds.com. 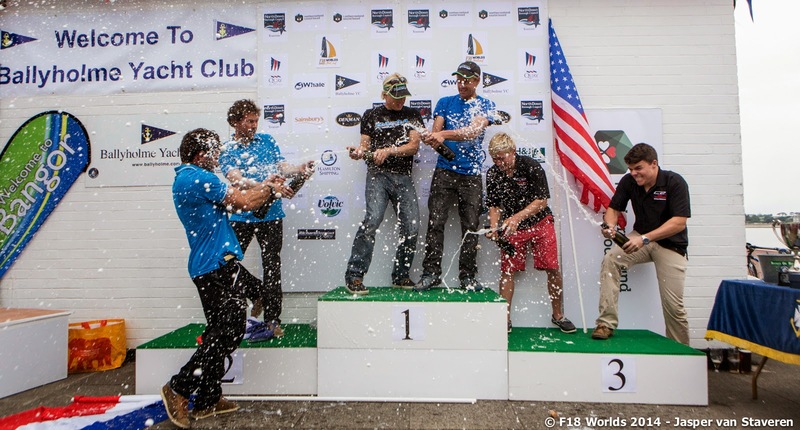 Last minute Update: Gunnar Larsen & Fer van West are crowned F18 World Champs 2014 at Ireland. With a 9,4,2 the Dutch crew closed a consistent event and had extra room as Ashby-Goodall missed 4 races on a hull breakage/hit in race 5. The Australians got back to the event and ended with an impressive 3 Bullets today, to show they were prepared to fight to the title. They finished 13th overall. But Gunnar & Fer were also up to the challenge as they started with 1,16,4,1 competing against the Aussies. 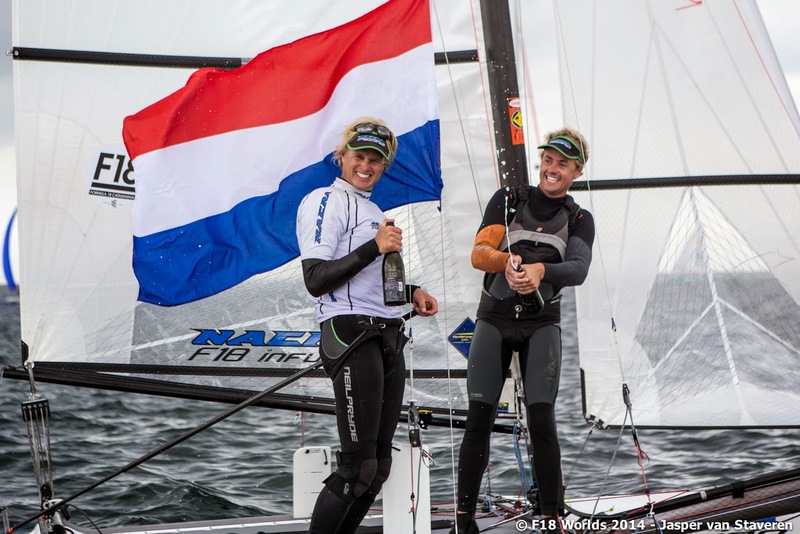 Great accomplishment for Gunnar, who was 5th several times, and has been sailing cats since a kid, later got involved with Nacra and ended managing the company with Peter Vink. 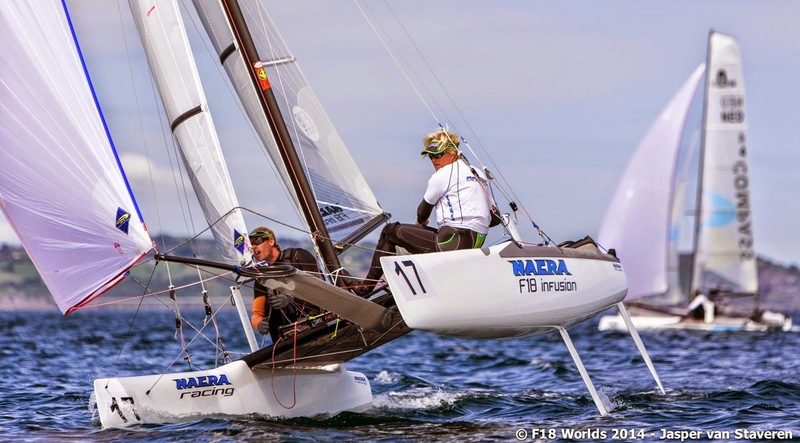 Together they have put Nacra as the number 1 brand in the market right now, helped with a big win at Santander Trials, where the Nacra 17 was selected as the new Olympic boat. Latest launch has been the Nacra F20 Flying FCS, with Ferdinand being involved in the development. Also a good revenge for van West that was close to the title at Erquy 2010 with Styles. The US Youth contenders, Taylor Reiss & Matthew Whitehead were leading but got high scores in low breeze, nevertheless a great championship for both, re assuring themselves they are ready for the big Titles. They were close this time and only the lack of breeze put them back in the last races. Still, they are Youth World Champs again after Grossetto. Previous favorites Bontemps & Amiot had a bad event start in the first races. Later they couldn´t manage to get the bullets needed to fight back, but they put on a nice recovery under pressure for the last part of the Championship that was not enough. The big note of this Worlds has been the French Youths: Solune-Perron, Tim Mourniac helming for his father JC and Berrehar-Pomelec getting 5,6,7th overall. Great future for the French fleet. Safran Team had to much up & downs and werent consistent enough to enter the Title fight. But being Morgan's second F18 event clearly shows his potential in Multis. The Arg team were in the top ten beggining the final day but ended 14th overall after some +20s in the light conditions. Good event for them sailing the Cirrus R for the first time, they were quite happy on the boat performance, in fact we are going to bring one to BA. Designs: Infusion, Phantom,C2, Cirrus R, Infusion,Cirrus R, Shockwave MKII, C2, Infusion. The Sirena Voile Shockwave is back in the top ten after being tied for 1st place in Belguim 2009, this time sailed by Emeric Dary & David Fanoulliere in a progressive performance that put them 8th overall after also a low start. Edit: Some protest have been filled, with Solune going from 6th to 9th, modifying Emeric's position & the top ten. Check updated results below / link. 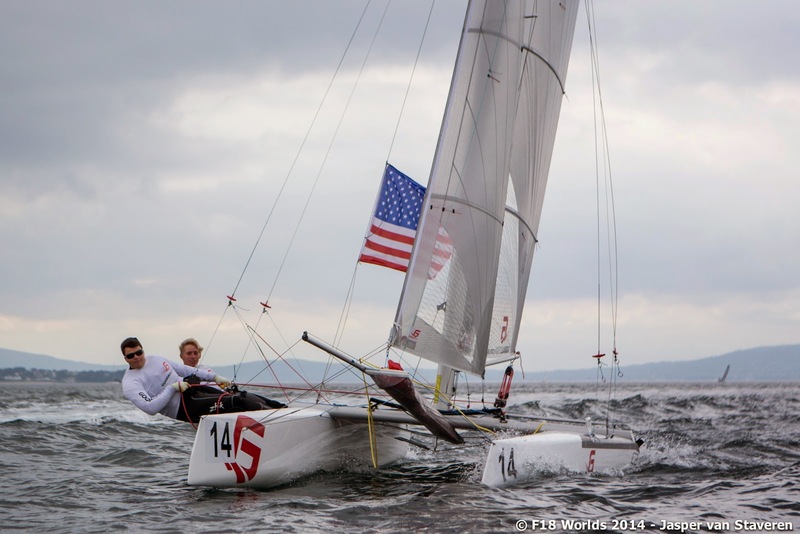 The Sach bros, 2005 World Champs, ended 10th overall, and they will be looking forward for Kiel 2015. 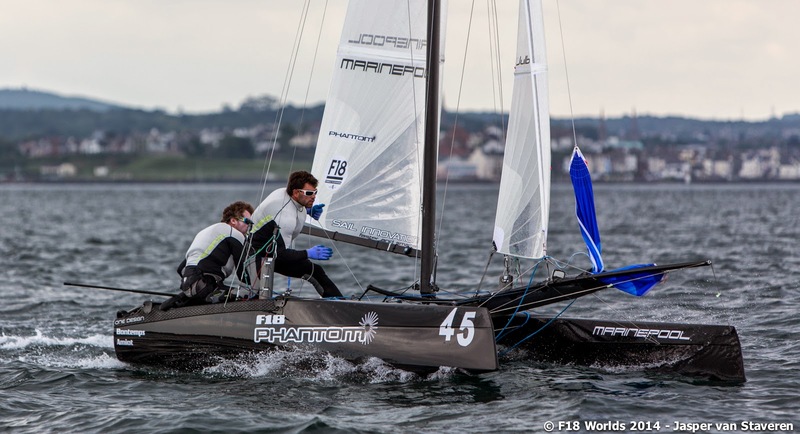 Great week of F18 sailing at Ballyholme Yacht Club in Northen Ireland with great ambiance, live coverage, instant online results plus Jasper van Staveren pics. Congrats to the Club and the Class for putting such an effort. - Full Results & Official Web at 2014.f18worlds.com.